Jon Danzig's World: Can austerity lead to prosperity? Can austerity lead to prosperity? Tonight I asked Professor Ha-Joon Chang, world renowned economist, if he could name any time in history when austerity measures led to prosperity. 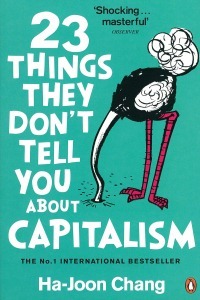 Thing 1: There is no such thing as a free market. Thing 2: Companies should not be run in the interest of their owners. Thing 3: Most people in rich countries are paid more than they should be. Thing 4: The washing machine has changed the world more than the Internet. Thing 6: Greater macroeconomic stability has not made the world economy more stable. Thing 7: Free-market policies rarely make poor countries rich. Thing 8: Capital has a nationality. Thing 9: We do not live in a post-industrial age. Thing 10: The U.S. does not have the highest standard of living in the world. Thing 11: Africa is not destined for underdevelopment. Thing 12: Governments can pick winners. Thing 13: Making rich people richer doesn't make the rest of us richer. Thing 14: U.S. managers are overpriced. Thing 15: People in poor countries are more entrepreneurial than people in rich countries. Thing 16: We are not smart enough to leave things to the market. Thing 17: More education in itself is not going to make a country richer. Thing 18: What is good for General Motors is not necessarily good for the United States. Thing 19: Despite the fall of communism, we are still living in planned economies. Thing 20: Equality of opportunity may be not be fair. Thing 22: Financial markets need to become less, not more, efficient. Thing 23: Good economic policy does not require good economists. Thank you for leaving me comment on Serious side of the world. I completely agree with Proffesor Ha-Joon Chang. Good investments – result good profit. If money circulate in good investments, is better than money in austerity. If you not create anything with your money, it loses value.